There’s a combination of soft, rolling hills, wide-open skies and rocky soils. The late-afternoon breezes sweeping up from the water to naturally cool the countryside. This is Los Carneros—unique, esteemed, expressive. It’s a harmonic convergence, of sorts, where the San Pablo Bay, Napa, and Sonoma come together. Los Carneros straddles both Sonoma and Napa counties. Many of the best vineyard sites here are in the foothills that cascade off the Mayacamas range. The elevation of our vineyards provides serious structural integrity to both the Chardonnay and Pinot Noir, distinguishing it from the lower-lying areas. 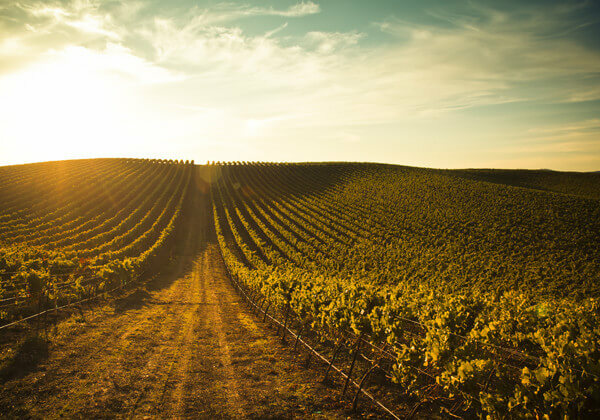 The best vineyards sites are in the foothills, where these thin, well-drained soils naturally restrict vine vigor and encourage firm structural elements in the wines. The vineyards of Los Carneros are subjected to relentless afternoon breezes that charge up the hillsides from the San Pablo Bay. This cools the vines, slowing the ripening process and preserving natural acidity and vibrant fruit flavors. Carneros is one of the coldest growing areas in either Napa or Sonoma. River stone complements crisp lemon zest and vanilla in this expressive chardonnay. Chardonnay produced in Los Carneros is available now. This wine offers intriguing minerality and spice, along with rich black cherry and notes of tobacco. Pinot Noir produced in Los Carneros is available now.